Even though it's the first time I'm writing something this "big", it feels like I know C# quite well (it is very similar to Java after all). It's been nice to learn LINQ also and I am very impressed by the features (which is just like Steams in Java 8), and perhaps I have overused it here (if it's possible to do that). SudokuRule: Whether it's a box, a line, a row, or something entirely different doesn't matter. Contains a collection of SudokuTile that must be unique. 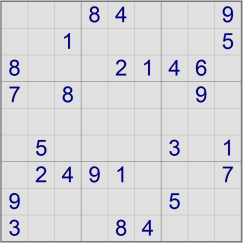 SudokuProgress: Used to know what the progress of a solving step was. Program: Main starting point. Contains tests for seven different Sudokus. All have been verified to be solved correctly. Since this is the first time I'm using C# and LINQ, please tell me anything. All suggestions welcome. Except for the fact that the method box should be called Box. I'd be especially interested in cases where I could simplify some of the LINQ usage (trust me, there is a lot). I hope you are able to follow all the LINQ queries. I have tried to put some short comments where needed to explain what is happening. If you want an explanation for some part, post a comment and I will explain. One known issue with the implementation is if you would input an empty puzzle, then it would work for years to find all the possible combinations for it. // The board has been completed, we're done! This is amazing. Especially for person who is not using C# every day for years. too many thing that are public that should be internal, sometimes internal members can be turned to private. Use the most restrictive access level that makes sense for a particular member. 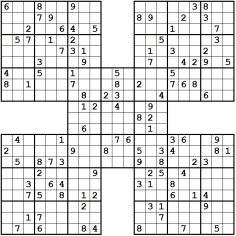 error-prone method AddRow of SudokuBoard. I'd prefer single string array passing to SudokuFactory constructor instead of multiple AddRow calls. It's easy to call this method too many or too few times to get a runtime exception. absence of some string representation of solution result that could be used in unit tests. console output method like Output and OutputRules in core classes. They should reside in Program because they are just used for console output, nothing more. absence of unit tests. I've moved your logic to separate library and added unit test project. This is the first thing I did when I started to refactor your code to be sure that my refactoring won't break anything. Also I'd use .NET Standard library type. This will allow to reuse the same logic for website, mobile (Xamarin) and desktop applications. Now I've added string tileDefinitions to all SudokuFactory methods. I've applied already mentioned refactoring ideas from other answers so I won't mention them separately. Also I'm using expression-bodied members, string interpolations and local functions from newer versions of C# which weren't available when you wrote your post. just because this is shorter. but even ToList method call is redundant here because this number collection are passed to SudokuTile.RemovePossibles which immediately modifies _possibleValues collection. so all your tile values are already distinct here. You're using existingNumbers as collection only for reading using Contains method, so IList<int> can be safely replaced with IEnumerable<int>. ToList call is redundant here because Contains method is not using deferred execution. I think it'll better to move all field definitions to top of the class with readonly modifier. Also I've add underscore to field names to enforce your naming convention consistency. Also I've change _rules type to List<SudokuRule> because it's more friendly with LINQ (because LINQ has ToList method but not ToSet). All short and simple one-time used stuff like CheckValid, TileBox, ResetSolutions, Simplify, SetupLineRules should be inlined or used as local function. Result file will be listed below. Also there are multiple places in this file where LINQ method syntax is shorter and much readable then query syntax. you wonder where _maxValue and tiles come from, and why _maxValue (whose naming convention is that of a private field) can be accessed like that - I would expose it as a get-only property. Accessing private fields from another object doesn't seem instinctively right to me. This line belongs just above the constructor that's using it (it's 30-some lines below its first usage). It takes the IEnumerable<Point> returned by the modified Box method, selects each point into the Key of a KeyValuePair and a new SudokuTile as the vale, and then ToDictionary selects the Enumerable into a dictionary, which gets assigned to tiles. (C#: 1, Java: 0) Lines of code: 1. In SudokuRule, your private fields can be marked as readonly. I like how your Solve() method yield returns all found solutions. That said, if your entire project is compiled into 1 single assembly (.exe/.dll), your usage of the internal access modifier is equivalent to public - internal basically means "assembly scope", so an internal type or method cannot be accessed from another assembly; if there's no other assembly, everything in the project can "see" it, so I don't see a point for internal here. Not much left to say, except perhaps method IsValuePossible might be better off as IsPossibleValue, but that's mere nitpicking. Very neat, I'm jealous. Each item in the collection initializer actually calls the .Add method anyway, so it's completely equivalent. Except it's 1 single instruction now. Can't read all this code on my phone even though it looks pretty well structured to me! Good job! I saw this. Isn't the exception message contradicting the if clause? CLEARED is set to 0, and the if checks for 'less than 0' so the value could be set to 0. Also, not having run the code, why does the toString() have four parameters on String.Format, only using three? I'll have a closer look when I'm at a computer, but nice work! I know next to zilch about C# so I won't be much help with this review, but I can say that it looks well thought out and implements some cool features. And like retailcoder I'm still working on my version (hoping to minimize the brute-force portion) using Ruby. If C# allows enums to implement methods, I would move CombineSolvedState into SudokuProgress. Forgive my Java syntax, but if this is allowed I expect it will be easy to translate. I think this SO question addresses the issue, and one answer says it's not directly possible without using a class instead of an enum while another implies that it can be done using extensions. Also, can't you use enums in a switch statement instead of a series of ifs? Standard, and less verbose, method of creating Tuples is Tuple.Create. If you had made your Tile, Rule, and Board immutable, as they are; sharing state between them would not have been a problem. 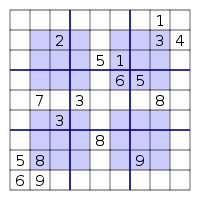 For example two Samurai Sudoku puzzles do share rules. Your model does not differentiate between an empty board and a partial assignment; A position of a board and an assignment to that position you call both Tile. You call Tuple<int,int> position in places. _rowAddIndex looks like an orphan. It clearly do not belong to that class. AddRow should be called some exact number of times. Before calling anything else. Seems like a constructor to me. 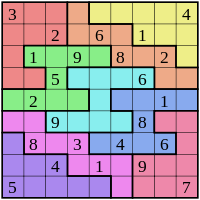 Also there is not differentiation between a puzzle and its solving method. A puzzle is an immutable structure. Every one trying to solve some puzzle on the newspaper is trying to solve the same puzzle. They use different methods and use different temporary data structures. Not the answer you're looking for? Browse other questions tagged c# linq community-challenge sudoku or ask your own question. When a constructor calls a helper function, should the helper mutate the object or return part of the object?